Who among us does not adore romance? The entire process is just, quite simply, the best. From the first heart-fluttering meeting, to the sometimes surprising discovery that she or he is THE one (which might just have happened already at that first meeting), to what’s called “courtin’” in the South. When it works, life doesn’t get much better. So, you’ve been seeing someone now for quite a while, working your way from harmless flirtation, to serious dating, to pondering a mutual future – and all of a sudden it hits you – this is real. Now it’s time to get really serious – buy a ring and start to think about that very special — and in fact perfect — a place to pop the question. So let’s get creative. Here are some amazing locations around Blue Ridge that are perfectly suited for this kind of major event. The venue speaks to your intentions as clearly as the ring itself and then there’s the act of presentation, of course, which usually involves getting down on one knee. 2. Mercier Orchards – They say that smell is more memorable even than sight or sound and we’re trying to make this occasion memorable, right? So, what better than the lilting smells of fresh apple cider? Mercier is a year-round venue for weddings, complete with lovely ponds and old barns, and apple sheds — a true rustic setting and there are plenty of perfect spots to get down on one knee, on that firm agricultural turf, with the Blue Ridge in the background, and be authentic and genuine as you pose the question. Women love earthy guys. 4. Swinging Bridge – for the outdoorsy, a hike to a waterfall is kind of your go-to, cliché place to pop the question. Sure it’s beautiful and woodsy, and wonderful, but it’s been done. For something a bit unusual, add in a swinging bridge – and Blue Ridge has one close by in Toccoa. It’s a nice short hike (about four miles) with beautiful views and the bridge is very cool. Great spot. Just don’t lean over the side with a loose grip on the ring. 5. Toccoa River Restaurant – You’ve got options. And some of those are more traditional. 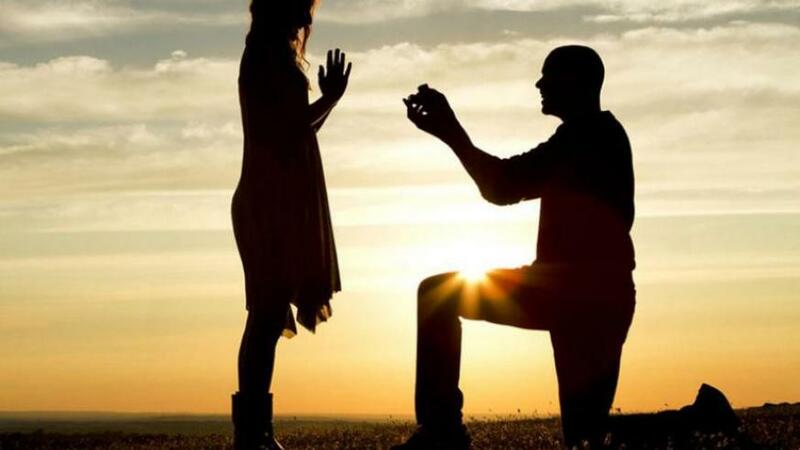 For example: romantic restaurant, romantic setting and what better for dessert than proposing to the love of your life? The Toccoa River Restaurant is one of those places that sits literally right on the river’s edge, with great views and wonderful food. Regardless of your choice, be sure to treasure this moment. Along with “where did you meet?” this will be among the top stories you will tell for the rest of your life.